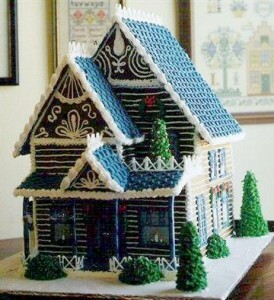 This is a really fine example of a Gingerbread log cabin House. This cabin has so much details in the intricate scrolls and swirls decorating it along with the simulated “logs”, windows with candles glowing inside, ornamental trim and details. Christmas wreathes and gorgeous green evergreen trees along a snowy path. Visit here for details.